« GIVE US YOUR MYTHS!!! The first myth has been presented. Does holding in a hit make you more high? Before we attempt to get to the bottom of this, let’s see what you think. Take the poll, it’s free, and you don’t need to sign up for anything. This entry was posted by Mythbuster on April 14, 2011 at 4:27 pm, and is filed under Pot Polls. Follow any responses to this post through RSS 2.0.You can leave a response or trackback from your own site. We’re working on integrating one into the site, but until then you can search us on Facebook. We just created a Facebook page and need someone to be the first to like us. 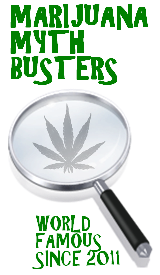 Just search “Marijuana Myth Busters”, were there. Thanks for your support, and check back soon. A few things you need to know about hemp.